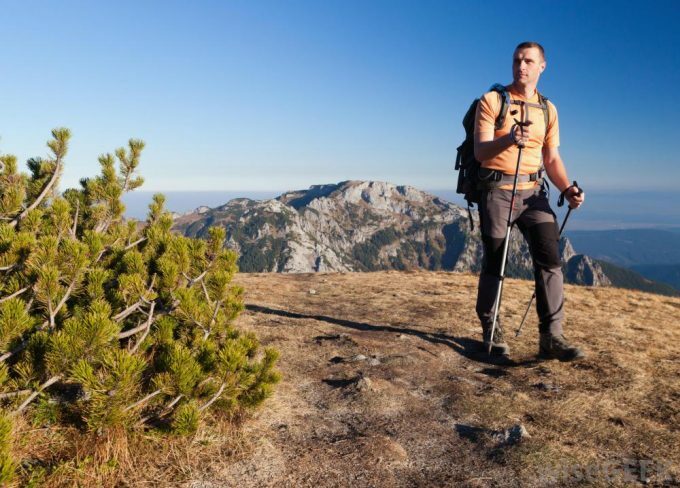 We are sure that you will agree when we say that hiking is one of the best outdoor activities you can do without putting your muscles and the entire body through too much stress. However, will you also agree that the only downside of hiking is that the weather, especially rain, can ruin the entire experience. So, how to make your adventures “weatherproof”? Easy, just include the best hiking rain gear in your regular gear list and you will not care for weather anymore. Having rain gear that you can hike in safely and stay mostly dry is essential for a quality, health safe hike. It is suggested that you layer up on clothing during the rainy season to stay warm and dry and even prevent hypothermia in some cases. Always wear a base layer, an insulation layer, a waterproof layer and socks. But, with so many rain gear products on the market, how can you be sure that the one you fancy is the right one for your needs? You will want to consider the type of weather protection it offers, as well as the shell of your jacket, what kind of gear is available and other important factors that you should consider before buying rain gear for your hike. We will show you what you what factors you should look into, to ensure that you buy rain gear that is built to last and will keep you dry and warm. Once you know what to look for, you will have a chance to read the reviews of the best models the market has to offer and the only thing there will be left for you to do is pick the gear you find the most suitable for your personal preferences. Here, we will discuss what features you should consider when purchasing rain gear for your next hike. Some things to keep in mind are that the item works well against the elements outside and that it is made with durable material that will keep you warm and dry. There are many types of hiking rain gear that include more than just jackets, boots and hats. You can also find ponchos, pants, and other rain gear, accessories for your hike in the rain. These items should be either water resistant or waterproof in order for you to stay dry. Keep in mind that the prices can be steep when you are purchasing quality rain gear products. That is because a lot of science has been put into it and the products are made with the hiker in mind. Shells can be used for not just jackets, but for parkas, ponchos and pants. There are a few different types that shall be explained. Hard Shell – Hard shells are going to be stiff and not insulated. You will need to wear a base layer and a middle layer in order to stay warm with this type of shell. However, hard shells are very breathable and they are waterproof. Soft Shell – With soft shell products, you have some insulation along with water resistance. Soft shells are breathable but are not the greatest in rainy weather. They are generally used for activities that cause a lot of sweating. Hybrid Shell – A hybrid shell combines a soft shell and a hard shell into one product. In this instance, your product will be able to breathe more on the sides, sleeves and back side of your jacket, for example. The top and the front portions of your jacket, for example, would be harder as well as windproof and waterproof. Insulated Shell – An insulated shell will be puffier, but is breathable and resistant against water. They are filled with either down insulation or a synthetic alternative. This generally provides the most protection against rainy and cold weather be down and synthetic materials are great at keeping out the cold and preventing rain from seeping through. Of course, you will want to take into consideration the type of weather protection your new jacket or other type of gear offers. Here, we will discuss some weather protection factors that you should watch out for. Waterproof – This type of gear will keep water or rain from getting through to your body. If your item is breathable, then you don’t sweat as much, but if it is not, then you may feel some perspiration while hiking. 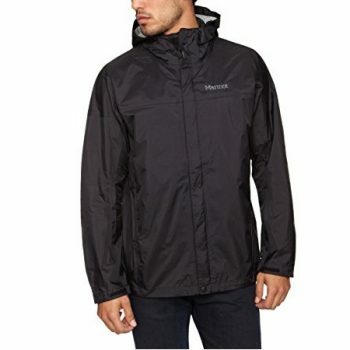 Water Resistant – These types of products would include windbreakers and the like. They resist water, but will eventually get soaked if the rain is constant. This type of gear is breathable, so you will not sweat as much, but you do not want to wear it if there is a lot of rain coming down. Windproof – A major plus is that if your jacket is waterproof, it is automatically windproof. Windproof items will block the wind, so you will not only stay dry, but warm, too! This is especially helpful for higher altitudes where wind can pick up. Wind Resistant – An item that is wind resistant will not block the wind totally but it will cut down on the amount of wind coming through your jacket, for example. If you are in a storm, this would not be something to wear. There are some other smaller factors to take into account when purchasing hiking rain gear. There are many details that can make a product work better, besides being concerned with the light weight, or being waterproof and windproof. Zippers – Jackets are usually made with several zippers and it is important to keep that area dry from rain by using a rubber coating. You will know if it is laminated with the rubber coating if it is harder to zip. Many jackets will have a small flap that will go over the zipper area to help keep the pocket dry. Hoods – For most rain gear jackets, the hood will be able to adjust as well as include a brim. 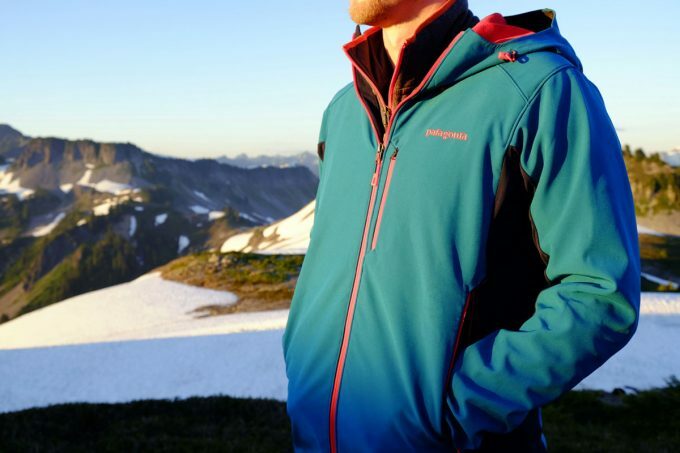 Some jackets allow you to unzip the hood completely and remove it if you like. Venting – Some jackets include a mesh lining in the underarm area to prevent too much perspiration and rain. They can also be put in the pockets. This keeps your jacket breathable and less smelly. Adjustments – Many rain gear jackets have a draw string to adjust to your comfort level. This will allow you to keep out the cold and rain and the rain will not come inside of the openings of your jacket. If you find yourself warm, you can simply loosen the draw string. Pockets – Some jackets have a few pockets, while some have many. If many pockets are important to you, you can check into ones that have a port for your headphones, and ones that have flaps to keep your pockets dry and look inconspicuous. Check out some of the top product reviews to see what is available on the market. At least one of these items can help you block out the elements outside on your next hike! 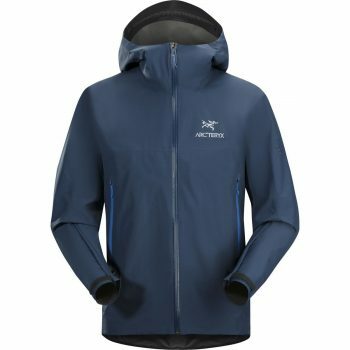 Description: The Arcteryx Beta SL Jacket is designed to be light in weight and great for most outdoor activities. 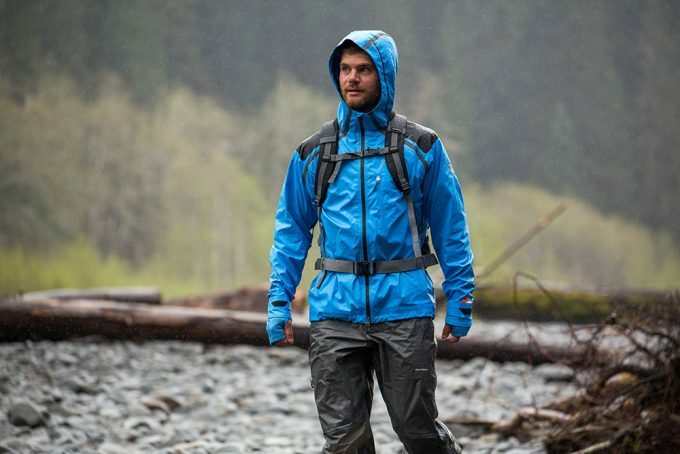 We like that these jackets have a great range of motion, are waterproof, and still breathable. Also, the hood provides extra protection against the wind and rain, plus the jacket is a slim design, which fits right to the body. It includes Gore taped seams and waterproof zippers. You will find this jacket in a Nocturne (dark blue) color as well as in black. 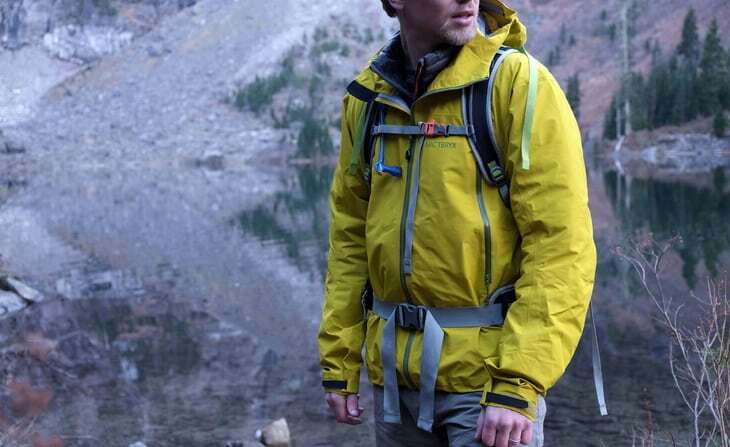 Made of nylon, this jacket is not only light, but will keep water from soaking you. It has a micro seam and is seam sealed to keep it waterproof. It is also given a Durable Water Repellent treatment to make water a non-issue. Also worth mentioning is that the zipper won’t catch and the jacket isn’t bulky at all. Furthermore, you will love the fact that beside being waterproof, can also be washed in the washing machine and tumbled dry without being afraid that it will get damaged and lose its waterproof ability. Related: If you plan on a multi day hiking trip, you will need a stove to heat up some dinner or simply prepare a hot beverage to warm yourself up after a day in the rain. The MSR PocketRocket 2 Stove is under $50 and is light in weight and can boil a liter of water in 3.5 minutes. 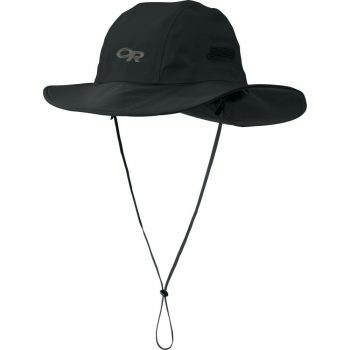 Description: The Outdoor Research Seattle Sombrero can protect you against the rain with its foam brim and waterproof fabric. It is not for use in extremely cold weather, but will keep you dry. It will do a great job of blocking the sun as well as keeping your head and shoulders dry. You might find this model to be the best waterproof hat you have ever purchased, but, we need to mention that you may start sweating in weather over 50 degrees Fahrenheit, and it is not great for windy weather. But, the feature you will find very useful is that it has an adjustment so they can fit it snugger if needed. This sombrero hat comes in many colors from black and blue to khaki and camo. It is made of all Nylon, with the lining made of all Polyester. It is waterproof and breathes well. There is foam in the brim and the hat includes hook and loops tabs, as well as a chin cord you can remove if you wish. Related: While hiking, you should consider the Hiker Hunger Carbon Fiber Trekking Poles which are made of carbon fiber, easy to grip and has a quick flip locking mechanism. 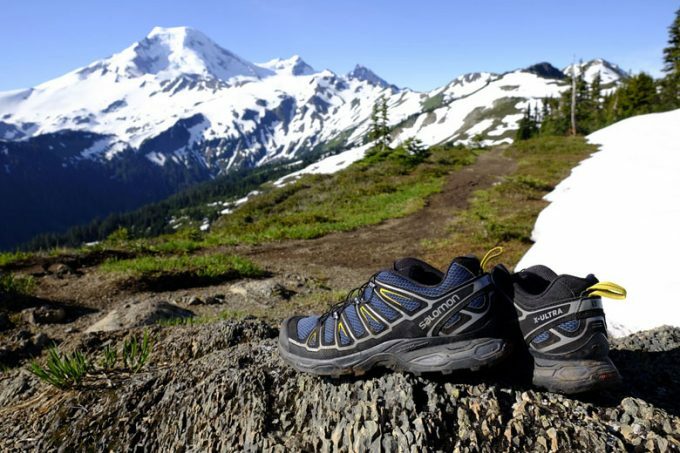 Description: When it comes to the Salomon X Ultra Hiking Boots, you will not be disappointed. These shoes offer foot control as well as protection. They also have a great amount of traction and use OrthoLite for the insoles that make your feet feel less tired. They are comfortable, light in weight and are true to size. We also have to mention that the shoes are waterproof and breathable and work in any weather, and those of you with flat feet, will love the arch support and wider toe area. These hiking boots do not look anything like regular hiking boots. They nearly look like street shoes, and are just as comfortable. Furthermore, they include a Gore Tex waterproof lining as well as speed hooks in the lacing system. There is also a gusseted tongue to keep out the dirt and rocks, and there is a rubber toe cap to protect your toes while hiking. Overall, this is a great pair of hiking boots that you will definitely love, despite the high price. Related: Be sure to have durable hiking socks like the Merino Wool Men’s Hiking Socks which are under $20. They are made of Merino wool, come in a 2 pack, and will make wearing your boots even more comfortable. Description: There are many positives about the Outdoor Research Helium II Jacket and that is why we had to include it in our list. The amazing thing about this jacket is that it’s unbelievably light in weight, and that despite the price, it is a great piece of rain gear to own. It will keep you dry on storm days with high winds, without a problem. Furthermore, the jacket comes with a drawstring in the hood, that you can use to adjust it to the shape of your face. It also includes a zip pocket for keys or a phone. As for the color choices, you can find this jacket in Pewter, Lemongrass, Glacier and Hot Sauce. It includes fully taped seams, an adjustable hood and a chest pocket that includes a zipper. You also get a stuff pocket that has a webbed loop. Overall, the comfort and warmth of this jacket make it a great choice, plus it is great with keeping away the moisture. Wind resistance is gone when it gets very wet. Related: Get the matching pants with this jacket so you can stay dry and warm completely! The Outdoor Research Men’s Helium Pants are waterproof, breathe well and are made of all nylon. Description: The Frogg Toggs Ultra Rain Jacket is made of all polyethylene. One of the highly appreciated features, as far as hiking is concerned, is that it packs down into a small size and can be used in any situation where rain is involved, from hiking in the great outdoors to everyday situations like baseball games. The jacket fits perfectly in your pocket or a backpack, for easy storage. You can find this jacket in two colors, which are blue and khaki and the price is affordable. 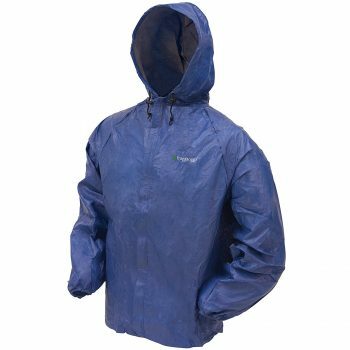 This lite rain jacket is made of all polyethylene and is waterproof and breathes well. The seams are welded for the waterproof feature. While the fabric can rip if given enough stress, it can be easily taped up with duct tape. It will keep you dry, and won’t leave you sweating from the fabric. You can even wear it in the snow for protection. Overall, this jacket packs down easily, keeps you from getting drenched, is super affordable, and comes with a reasonable price. 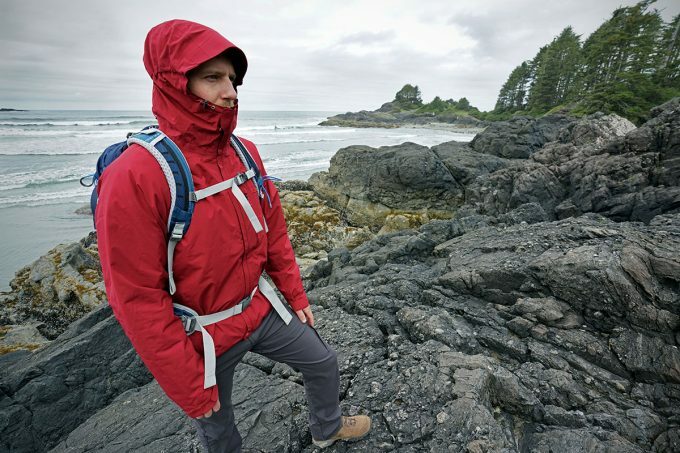 Related: The jacket will keep your upper body dry, but what about your gear? 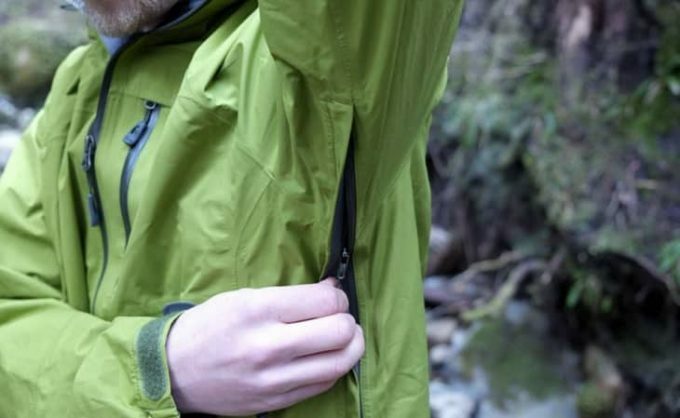 The Frogg Toggs – Stuff Sack will keep your items dry as you hike a trail. It is made from polyethylene and is super affordable. Description: The Marmot Precip Jacket is a great choice for various types of outdoor activities, due to it being windproof and waterproof. Sizes may run a little big if you are looking for a fitted jacket, so be aware. We loved how this jacket offers the quality for the value, as it does its job exceptionally. Furthermore, it has arm pit zips, which works well when the temperature is higher and you need ventilation. It packs small, plus it is made from quality materials, so it will last you a long time. This jacket comes in so many colors, you are sure to find the one you like best. While the price ranges wildly, we think that this jacket is definitely worth it because it works so well. Not only is this jacket made of nylon but it has a chin guard, stuffs into itself and has an elastic draw cord in the hem. Overall, this jacket is one to try out when you are searching for a durable piece of hiking rain gear. Related: If you are looking for a full body rain protection, we can recommend the Marmot PreCip Pant: Shell. They have a back zip pocket as well as front pockets and breathe well, even though they are completely waterproof. 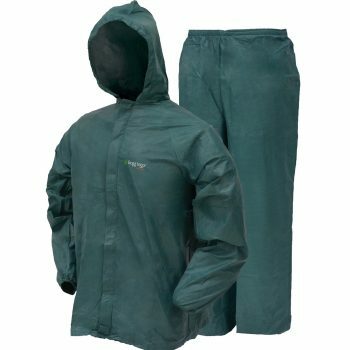 Description: The Frogg Toggs UltraLite Rain Suit is a quality product that comes with an included stuff sack, has a wide array of size choices, the ability to breathe well, and the fit is great. This jacket and pants combination is not only affordable, but also works quite well. You can find it in blue and yellow colors, and allows you a great range of motion while wearing, and it won’t make you sweat as you try to wait the rain out. Overall, you will definitely enjoy this jacket and pants duo because of the low price and the fact that it repels water exceptionally. Definitely worth checking out and buying as an emergency rain protection part of the gear. Related: The Frogg Toggs Breathable Boonie Hat is a nice hat that breathes well and comes in 3 colors. For under $10, you are getting a great product to protect your head. Description: The Tour Master Boot Rain Covers truly do their job of keeping even tall boots dry as well as clean. 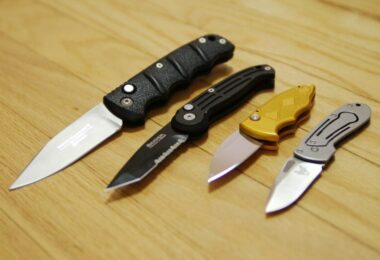 Many people use them not only for hiking and outdoor activities, but for riding their motorcycles. Furthermore, the light weight, the fact that they pack up easily, and the fact that they last a long time before showing wear and tear, is more than enough to make you be sure that you haven’t made the wrong choice. They feature an open bottom with a strap, so that you still have traction while hiking or riding a motorcycle. For the price, you can’t beat the quality, and these are high performance covers that are all waterproof and include reflective safety strips on them. The closure is made of elastic material, which allows you to snugly fit the covers over a wide range of boots. They will fold up small to store and can handle not only rain, but mud and snow as well. 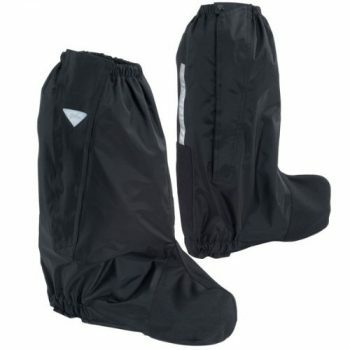 Overall, these boot covers are top notch and will keep you from getting wet and dirty. Related: It is also important to wear good hiking socks. The MOXY Socks are inexpensive, high tech and vent well. Description: The Columbia Rebel Roamer Pants can be the perfect choice because they roll up small, have a drawstring and are not noisy, like some rain gear pants. The down side is that the Velcro can gather grass or dirt at the bottom of the legs, and they do not have a strap at the bottom when wearing boots. Also, these pants run big, but they are not bulky at all and are a good quality for the price. Also worth mentioning is that these pants are made of all nylon and can be washed in the washing machine at home. They are not only waterproof, but include the draw cord at the waist as well, making them adjustable, while the leg openings are adjustable as well. 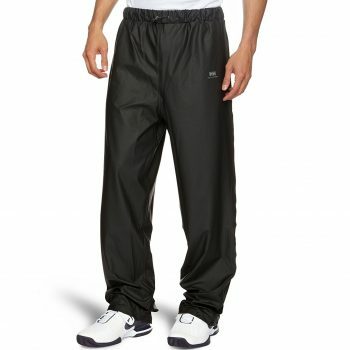 These pants will definitely protect you as you hike through the wooded trails, and keep you dry if you run into rain. Plus, they fit well because you can adjust them, which is what we found quite useful. Related: Once the day is over and you make your campsite, you will need a lantern so that you can get ready for the deserved night’s rest. The Ultra Bright LED Lantern is under $10 and is very bright. 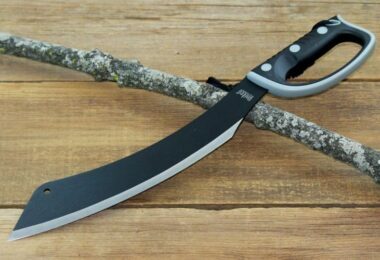 It can be used outdoors or during power outages. 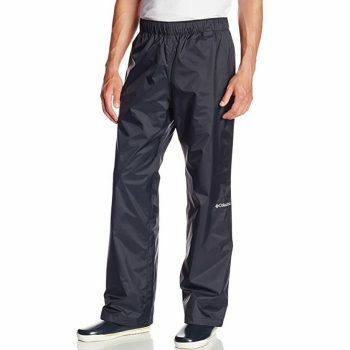 Description: The Helly Hansen Voss Rain Pants are waterproof and made of 100 percent polyurethane. They will allow you to stay dry even through a rainstorm with strong wind. Furthermore, that these pants are quick drying, but they can run a little long, so be aware when choosing the size. Also, they do include snaps on the bottom to be able to be used for a hike or on a motorcycle. We should also mention that the pants are thin enough that you won’t be cold, as they are warm, but won’t make you sweat, thanks to their breathable properties. When the weather is rainy, the water beads up tightly onto the pants, but they won’t soak through. All in all, we like these pants because they are made of polyurethane and treated for waterproofing, and they are comfortable and fit great for the taller hikers, too. These are definitely great pants that you definitely should look into if you are serious about getting some great hiking rain gear. Related: The Helly Hansen Men’s Seven J Jacket is a great jacket that is light, comes in many colors and will keep you warm as you hike. 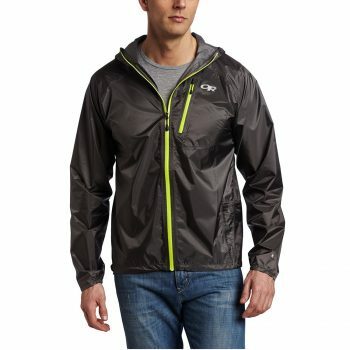 Under $100, this jacket definitely stands out of the crowd and is a perfect addition to your rain pants. With the Voss rain pants and the Seven J Jacket, we have reached the end of our article. As you can see, there are many features that should be considered when purchasing hiking rain gear. You have to think about if your product breathes well, can withstand the cold and rainy weather, as well as wind. With the help of our features to consider section, you have a much better idea which features you consider as the most important for your rain gear choice. All in all, there is so much to think about, and hopefully, some of the reviews have helped you choose what products you need when you go out on your next hike. Until then, stay dry! Now, it’s your turn to share the thoughts. Did we miss any of your favorite products? What do you wear on your hikes? Leave us a note in the comments, and thanks for reading!